PT Angkasa Pura I (Persero) - AP I or widely known as "Angkasapura Airports" is a major state-owned commercial airport operator in Indonesia. Angkasapura Airports operates primarily as a commercial airport operator in the middle and eastern parts of Indonesia. Headquartered in Jakarta, Angkasapura Airports now operates 13 commercial airports, namely Adisucipto Yogyakarta (JOG), Ahmad Yani Semarang (SRG), Adisumarmo Surakarta (SOC), Juanda Surabaya (SUB), I Gusti Ngurah Rai Bali (DPS), Lombok Praya (LOP), Sultan Aji Muhammad Sulaiman Sepinggan Balikpapan (BPN), Syamsudin Noor Banjarmasin (BDJ), Sultan Hasanuddin Makassar (UPG), El Tari Kupang (KOE), Sam Ratulangi Manado (MDC), Pattimura Ambon (AMO), Frans Kaisiepo Biak (BIK), Ngurah Rai Commercial SBU Bali. Angkasapura Airports is a non listed state-owned company and is 100% owned by the Government of Indonesia which represented by the Minister of State-Owned Enterprises (SOE). Angkasapura Airports supported by 1 strategic business unit, 5 subsidiaries; PT Angkasa Pura Hotel (99.99%), PT Angkasa Pura Logistik (98.00%), PT Angkasa Pura Properti (99.96%), PT Angkasa Pura Suport (99.81%), PT Angkasa Pura Retail (97.50%). PT Angkasa Pura I (Persero) also supported by 4 associated companies; PT Gapura Angkasa, PT Jasa Marga Bali Tol, Angkasa Pura Airports Pension Funds (DAPENRA), and Yayasan Kesejahteraan Karyawan Angkasa Pura Airports (YAKKAP I). In term of financial performance, Angkasapura Airports generally recorded a good performance in 2017. According to information found in PT Angkasa Pura I (Persero) Annual Report 2017 as cited by JobsCDC.com, total revenue reached in 2017 amounted to Rp7.19 trillion. This number is up 17.20% year-on-year (YOY) from Rp6.13 trillion in 2016. Total net profit for the year 2017 reached Rp1.42 trillion or up 22.49% YOY from Rp1.15 trillion in the previous year. Total Asset in 2017 went up by 5.85% YOY worth of Rp25.05 trillion as compared with Rp23,66 trillion in 2016. Minimum D3 degree in any field, except Art, Teacher Training, Philosophy, Religion, Public Health, Nursing, Agriculture, Animal Husbandry, Forestry. Proportional body posture (Minimum height of 170 cm for Male and 160 cm for Female). Minimum D3 degree in Electrical Engineering, Mechanical Engineering, Electricity Engineering, Automotive Engineering, PKP-PK. Proportional body posture (Minimum height of 170 cm for Male). Proportional body posture (Minimum height of 165 cm for Male and 160 cm for Female). Indonesian citizen (WNI), birth in '1994 and thereafter. Minimum D3 degree with a minimum GPA of 3.00 (on a scale of 4). The candidates with education background higher than D3 are welcome to apply, but a staff basis will be equal to the qualifications of D3. Physically and mentally healthy, do not have a history of infectious diseases that are stated by a Health certificate issued by a doctor / hospital government. Have a sturdy body posture. No glasses / contact lens. Single/not married and willing to not get married during the prospective employee period. Well behaved (stated in the SKCK). Never been discharged with disrespect as an employee of an agency. Willing to be placed in the entire working area of ​​PT Angkasa Pura I.
JobsCDC.com now available on android device. Download now on Google Play here. Please be aware of recruitment fraud. The entire stage of this selection process is free of charge. 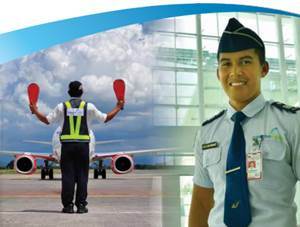 PT Angkasa Pura I (Persero) - D3 Fresh Graduate AVSEC, ARFF, Airport Operation Officer Angkasapura Airports January 2019 will never ask for fees or upfront payments for any purposes during the recruitment process such as transportation and accommodation.